Tiara syndrome. Tunneling. Time Confetti. 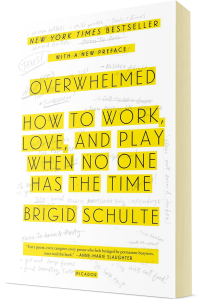 If you don’t already know about these terms, you will after hearing me talk with award winning journalist and bestselling author of Overwhelmed: Work, Love & Play when No One has the Time, Brigid Schulte. When we don’t have the time or make the most of our time, we get overwhelmed. Anxious. Stressed Out. Burned Out. And then the self-criticism just rolls over us like a MACK truck. We are stuck in a downward spiral and suddenly being good to ourselves is just another overwhelming task. 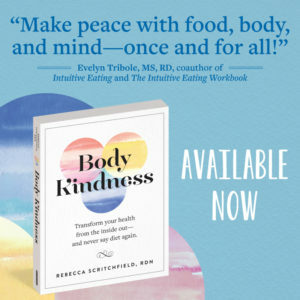 Most people will admit that “having enough time” is a significant barrier to their Body Kindness self-care practices. What if I told you that it’s not YOU, it’s a cultural sickness. 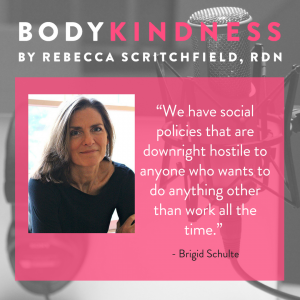 My guest Brigid Schulte kicks off our conversation about the systemic issues that keep our culture feeling this time scarcity (hint: America’s work culture has some “work” to do). Then we have a conversation about mindset interventions you can try on yourself and ways you can more realistically schedule your time (plus let go of time sucking tasks). 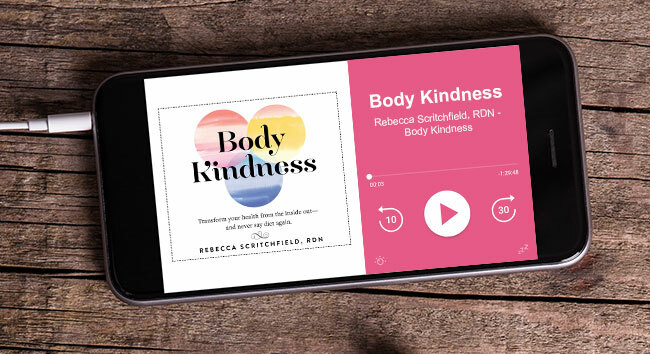 We close with a chat about creating space and starting with small, consistent behavioral patterns and learning how to work smarter and better. This is how you’ll “spiral up” your energy, emotions, and mood. You’ll soon notice you are creating a better life. Just don’t expect it to be perfect. You’ll get stuck in time scarcity again, but next time, you’ll know how to reset your boundaries, start small, and carry on. Paid family leave – how much time is enough? Brigid Schulte is a writer and journalist, and author of the New York Times bestselling book on time pressure, Overwhelmed: Work, Love & Play when No One has the Time, which named one of the notable books of the year by the Washington Post and NPR, and won the Virginia Library Association’s literary nonfiction award. She has spoken all over the world about the causes and consequences of our unsustainable, always-on culture, and how to make time for The Good Life by redesigning how we work, by re-imagining gender roles for a fairer division of labor and opportunity at work and home and, instead of seeking status in busyness, by recapturing the value of leisure. She was an award-winning journalist for The Washington Post and The Washington Post Magazine and part of the team that won the 2008 Pulitzer Prize. She now serves as director of The Better Life Lab at the nonpartisan think tank, New America, which uses data, storytelling and policy analysis to show how work-life, work redesign, gender equity and updated social policies are key to excellence, productivity and innovation at work, as well as a full, authentic and meaningful life for everyone. She lives in Alexandria, Virginia, with her husband, Tom Bowman, a reporter for National Public Radio, and their two children. She grew up in Portland, Oregon and spent her summers with family in Wyoming, where she did not feel overwhelmed.